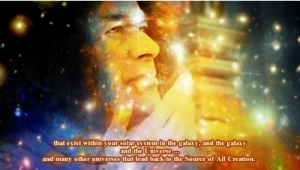 Valerie: It is Tuesday, the 1st of December 2015; and we are calling upon Cosmic Sai Baba to make his presence amongst us; we welcome him – and receive his message. ❝I am here. And I am very pleased to be here. As usual, I know I am welcomed and for that reason I enjoy coming and sharing. Because – of course – the message does go out to many, many people – do not think it is just the few of you. There are many and I am speaking from a place in which I know. And so, I thank you for being here My Children. I hear you talk this morning about the outer area of your Earth – your atmosphere and you think about it in the daytime – it is blue. A beautiful blue sky at times, mingled with white clouds – or even dark clouds but you can see it because of the Light. And then at night it opens up because you can see the whole of the Galaxy or the night sky full of stars. Full of stars that are like your Sun and so there are many, many solar systems out there, I can assure you. And there has been a time, when people (and still are) looking for the existence of life in other worlds. And I can assure you there is. For I am speaking now from another place – not necessarily on your Earth – although I have a “foot holding” here in my Light Body and working with those who I do – called the Sukshma Group. They help me to hold the energy here on this Earth. I do not have to be in an earth body. They have willingly given me the preparation, shall we say, or using their energy fields that is in an earth body and so they help me to hold my Light Body here on your Earth. I hope that makes sense. I am spelling it out a little, like a child in a way, but there are people out there who do not believe a Light body exists – let alone do things and work – and indeed that is what I am doing. I am achieving a lot more now that I could in an earth body – for I am not limited by the things that happen in a day to day area. And so, I think if you think about it – what is happening with the Sukshma Group is quite astounding and I am very pleased that I have the people around me that assist me and help me and also the people that are coming back to accept me in a Light Body; for they know that it is real. And I am REAL. I can assure you. I have been here, but I have been in other places – it is a bit hard for an earth brain to think that it is possible to be here, there and everywhere. A little like your ‘twinkle toes’ or whatever she is called. But I jest. The fact is, that the energy that I hold can be everywhere, and it is. You can all tune into me and become, if you like, “Sai Baba’s” ! Or you could be the energy of Universal Love from the Creative Source. Whatever you choose, either way it links you straight away to what is really true. Now, Truth is a word that is fragmented at times. Some people believe they are hearing, seeing or feeling truth. And others do the same and yet the truth seems to conflict. Now this is what is happening upon your planet. There is confrontation because people believe they are hearing truth. And others think they are hearing truth also. But it is in conflict. It is creating wars. And I can assure you, if you are hearing the Truth from the Source of All Creation – and think of that word – it is CREATION – not destroying – and if you think of war -it is destroying – is it not? So this is in conflict with the Truth from the Source of All Creation. Others ways can be used and achieved to find Peace upon Earth. And other ways are being used by your leaders, and by people – individual people – who have that love of God in their hearts. If you listen, and feel and pray every day for forgiveness for anything that may have been done to cause conflict – because they may have done it at a time when they thought they were doing the best – but not so when you look back. However, you can make it right. All you have to do is to carry an olive branch and ask for forgiveness; forgiveness for all those around you – forgiveness for the self – and forgiveness from the Source of All Creation. And that will clear any energy that is in conflict – I hope you are understanding what I am talking about when it comes to conflict. Because you are being asked – and you are actually raising in consciousness – to a place where there is no conflict. Which means, of course, you have reached the blessing of World Peace. So if you think about that and how easy it is to ask for forgiveness, you will understand and know why you can receive that energy and blessing very quickly – if you truly come from the Source of Creation that is in your heart – and that is one of Love and Love Alone. I hope I am giving my message with clarity today – for it is important for you to hear, to see, to feel and experience.